DESI will create the largest 3-D map of the universe by gathering light from tens of millions of galaxies after its scheduled startup in late 2019. It is designed to provide more precise measurements of dark energy, which is accelerating the universe's expansion and looms as one of the universe's biggest mysteries. 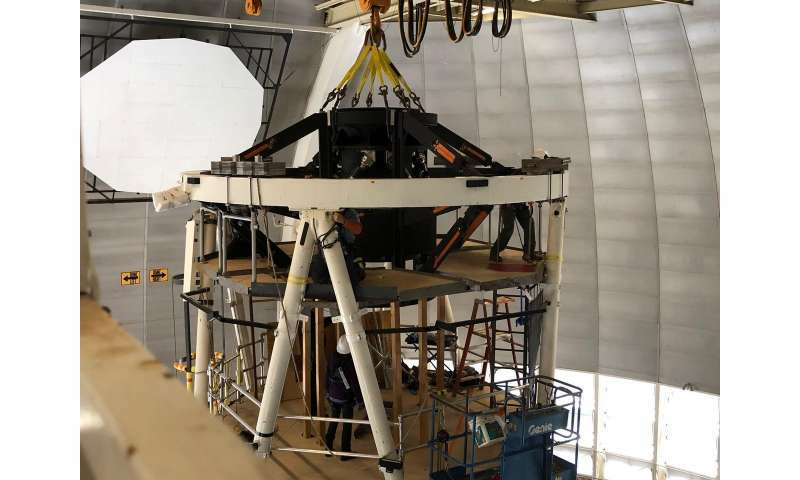 "Earlier this year we removed the old top-end of the Mayall Telescope, and Wednesday's installation brings this telescope back to life with a new purpose," said DESI Director Michael Levi of the Department of Energy's Lawrence Berkeley National Laboratory (Berkeley Lab), which is leading the project's international collaboration. "The more than 23,000 pounds of instrumentation that was installed represents the final top-end assembly." 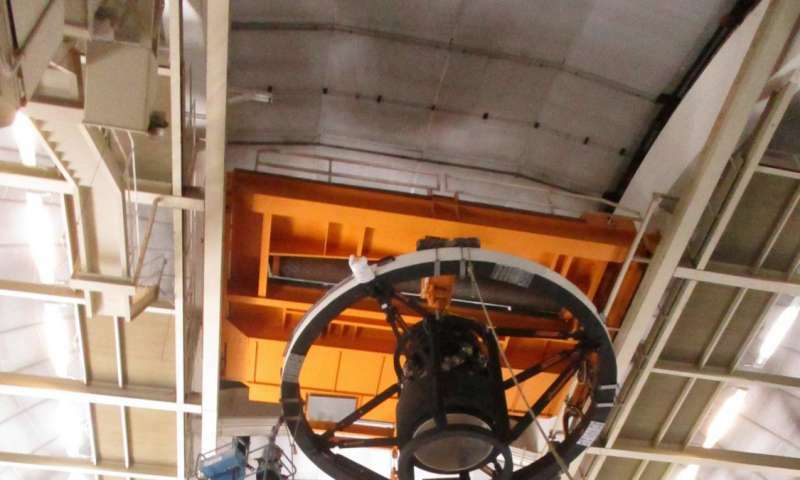 Also, the corrector is attached to a 1.1-ton six-axis "hexapod" that enables precise alignment adjustments; a surrounding ring, cage, and vanes support structure that weighs an additional 5.2 tons; and about 2 tons of other materials, including placeholder weights for DESI's focal plane (see a related video), which is still under assembly and hasn't yet arrived on site. The corrector will enable a larger field of view – covering an area more than 40 times larger than the telescope's previous corrector, and more than 40 times the size of the full moon as seen from Earth's surface – for a series of 5,000 robotically positioned fiber-optic cables that will gather light from sequences of targeted galaxies. This light will be analyzed to gather information about their distance and the rate at which the galaxies are moving away from us. Its large field of view will allow DESI to map one-third of the night sky during its planned 5-year survey. Each of the corrector's six lenses began as a large, thick piece of glass made by either Corning Glass in New York, Ohara Corp. in Japan, or Schott AG in Germany (see a related video). 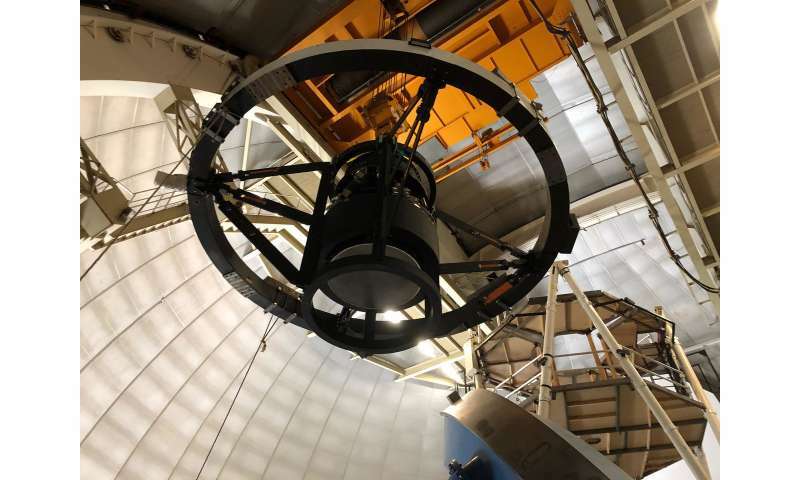 One of the lenses housed in the corrector is among the largest to ever be fielded on a telescope, noted Berkeley Lab's David Schlegel, a DESI project scientist. The lenses traveled the world for polishings and coatings at several companies, and were installed and precisely aligned inside the corrector barrel in a basement at the University College London last spring. David Sprayberry, the KPNO site director for DESI, said, "This was a complex lift that went without a hitch. We had a dozen of our technical personnel ensuring that the new top-end would be positioned exactly onto the center of the telescope. I'm very proud of my team for pulling this off flawlessly." Early next year, researchers will mount a set of cameras and other instruments onto DESI's focal plane to test how the lenses perform across the entire imaging field. This commissioning camera array was built at Ohio State University. "This will be a real test to determine if all the lenses are working together perfectly," said Paul Martini, a professor at Ohio State University who oversaw the development of the commissioning camera.